Visit Drier's and experience a trip to the past. What was originally a wagon repair shop, the building that houses Drier's Meat Market was converted to a butcher shop in 1875 by an Englishman named Alec Watson and called it The Union Meat Market. Ed Drier, Sr. was hired by Alec Watson when he was only 10 years old for a 25-cents-a-week delivery boy. Ed was eventually promoted to clerk at $6 a week and, in 1913, he bought the store from Watson. 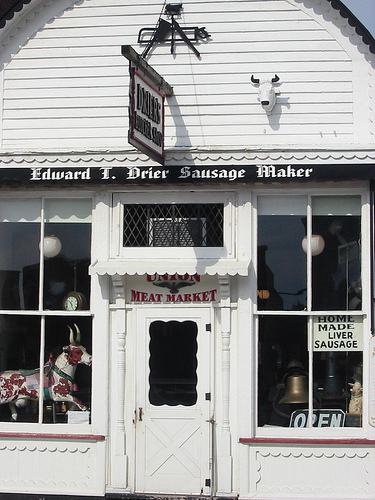 Drier's Meat Market has been recognized by as a National Historic Site since the time of it's opening in 1875 which means it has been in continuous use as a butcher shop since shortly after the Civil War. It has a pre-Civil War front and many of the original elements of the building still exist, including the four-paned windows that pre-date plate glass. There's sawdust on the floor, old butchering tools and a meat rack with ornamental cows. The smoke house used to produce Drier's famous ham's, bacon and ring bologna (spelled "baloney" by Ed Sr.) is more than 100 years old. Drier's has been written about in the Chicago Sun Times and Tribune, Michigan papers from Benton Harbor to Detroit and in many Travel Magazines (such as Food Finds magazine.) The theme is always the same: It's a pleasure to see a family doing something they enjoy for so long and doing it so well.